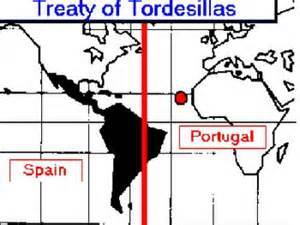 Treaty of Tordesillas (1494) - Have you ever wondered why Brazil speaks Portuguese while most of the rest of South America speaks Spanish? It's because of the Treaty of Tordesillas. At the start of the Age of Exploration, Spain and Portugal were the two strongest naval powers on earth. After Columbus returned to Europe, Portugal was the first nation to lay claim to the new lands. But as he sailed under a Spanish flag, Spain was quick to dispute Portugal's claim. Fearing that war might break out between the two nations, King John II of Portugal opened negotiations with Ferdinand and Isabella of Spain and they hammered out a treaty that drew a meridian which ran north and south 370 leagues west of Cape Verde. Everything west of the line went to Spain and everything east to Portugal. This line sliced right through South America but missed North America. As a result, Portuguese colonists settled in eastern South America, which became Brazil, and Spanish colonists settled in western South America.